I was born at the shore and have never lived more than 500 yards from the ocean. Can’t say I ever want to leave. A walk on the sand or a dip in the ocean has the rarest of rare uplifting power for me and so many others. Both energy and peace can be found at the water’s edge. Life there feels better. 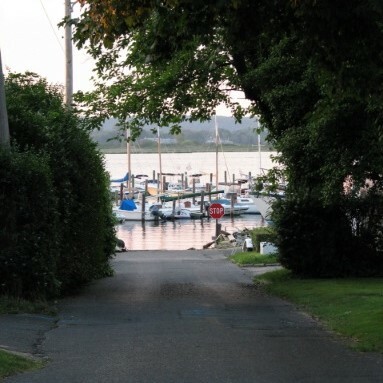 “Crab Alley” in Monmouth Beach. It’s in my genes too. My parents loved the shore life. Dad was a lifeguard on Long Island, NY beaches for many summers and the first chance he got, he moved his family and his medical career to the Jersey Shore in the early 1950s. It was a very smart move. Mom grew up spending many happy summers at “The Reservation” just over the border in North Long Branch (now Seven Presidents Oceanfront Park). As we await another fine summer at the Jersey Shore, I maintain that owning a beach house is worth it. Even a modest beach house can offer life-fulfillment. Realtor.com recently released a report ranking America’s best bargain beach towns. The list of “Most Affordable” beach towns includes two New Jersey communities with one being in Monmouth County. As part of its report, Realtor.com also listed the “Least Affordable” beach towns in the USA. At the top was Malibu, CA ($3.9 million), followed by Water Mill, NY ($3.7 million), and Manhattan Beach, CA ($3.1 million). Just one NJ town made the top 10, Avalon, NJ ($1.4 million).